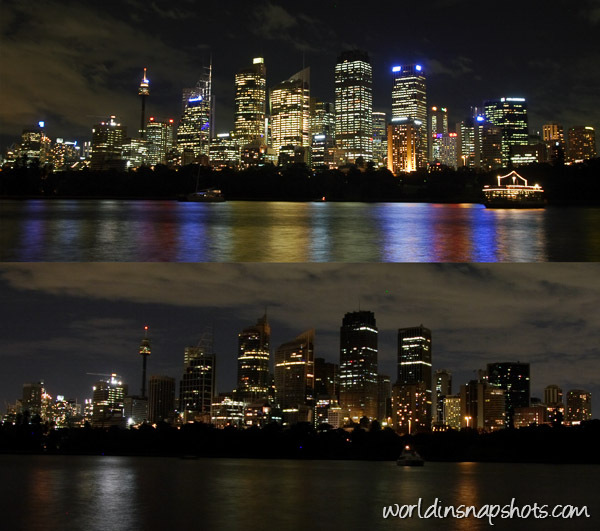 Personally Earth Hour is one of most excited events in Sydney. Six years ago Earth Hour started in Sydney and last year more than 6000 cities and towns in 135 countries worldwide switched off their lights for Earth Hour. This year 150 countries are joining. Are you turning off your lights during Earth Hour tomorrow? Above photo was taken in 2008 in Sydney where everything started and this year hopefully even less lights were visible. This is interesting, I can’t wait till new photos of this year come out. There is no Sydney yet, but plenty other interesting places. Nice shots. We were in Vegas for Earth Hour and I was surprised at how many lights there were even after The Strip ‘went dark’ as they said. Makes you realize how much energy is being used. @Jackie, have you any pictures from LV? Good to see how environmentally conscious the Aussies are. Very cool. Hopefully next time they turn off even more lights.